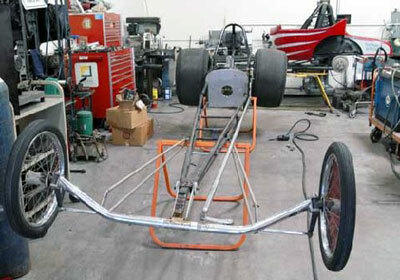 This page chronicles the restoration of a Jim Davis built 1968 Top Fuel dragster. 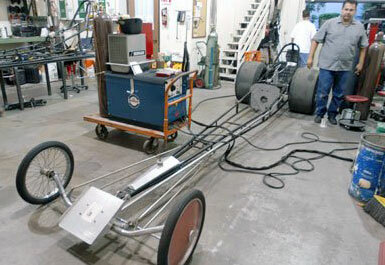 Like its stable mate, The BankAmericar, it is currently one of the staples at "Cacklefest" and other events. 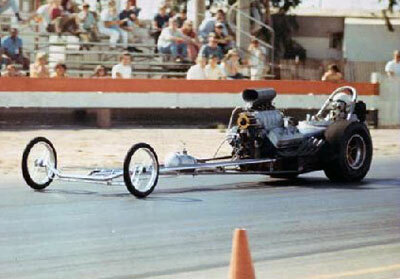 Car was built in 1968 as a top fuel car for Texas standout, Don Mad Dog Cook to replace the Jim Davis car that he crashed. 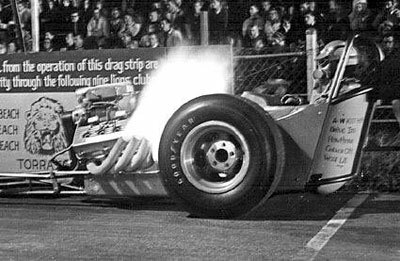 Cook never took delivery so the car was sold to Don Webster in 1969 and he raced the car in Top Gas and Top Fuel until 1971. After throwing a rod out of the Hemi at a race in Redding, California on Labor Day in 1971 Don sold the car to Jerry and Tom Brazil at the track. 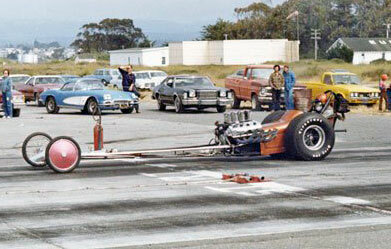 The Brazil brothers raced the car with a 426 Hemi on gas until it was parked in 1981. 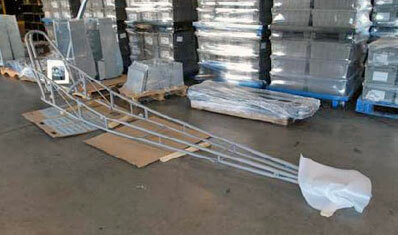 It was then sold to by the Brazil's to Bill Norman who wanted to also race it. Fortunately he got hooked up with John Ewald before the car was "updated" and traded it to him for a no pedigree Woody car that Ewald had purchased. 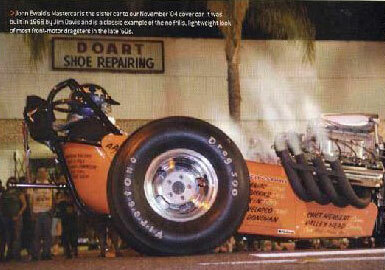 Ewald got the completely original car (less engine) in 2004 and restored it to a 1969 Top Fuel configuration. 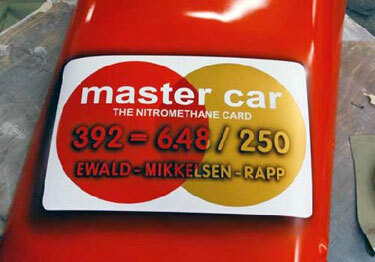 Keeping with the credit card theme (as in Ewald's BankAmericar) the car was named the Ewald-Mikkelsen-Rapp Master Car. 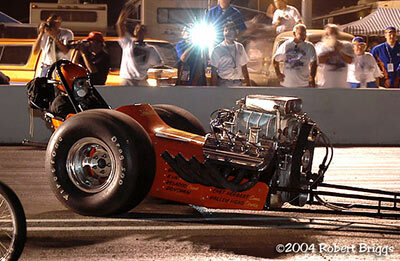 The car made its first appearance in 22 years at the 2004 California Hot Rod Reunion. 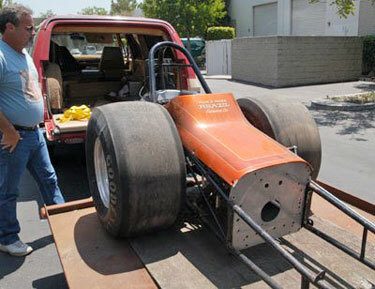 Alex Mikkelsen, owner of American Roadster and legendary drag racer Ronnie Rapp were involved with the car as restorers and engine builders and being good friends of Ewald's were made part of the team. It was just like the old days when buddies pooled their resources and went racing, back then racing was done for fun and the cars were not corporate billboards. 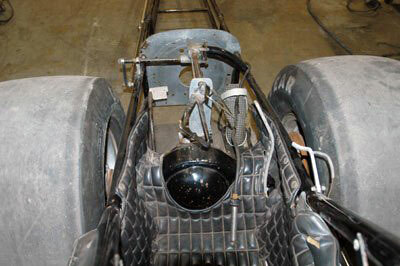 The car was originally built by NoCal chassis builder/racer Jim Davis in 1968 for Don "Mad Dog" Cook to replace another Davis car he had crashed in Texas. Bill Webster bought the car from Davis when Cook couldn't take delivery due to finances. He told Jim to sell the car and he got a job driving for someone else. 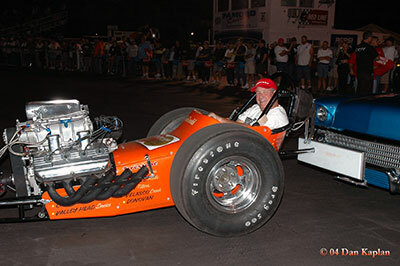 Bill ran the car from 1968 to 1971 in Top Gas and Top Fuel. 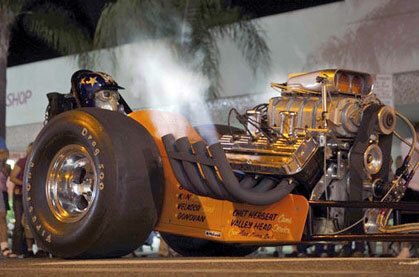 The original body was hand made by Webster until he could afford a Bob Haggerman body which he got just before he sold the car along with the new long fuel tank (below). 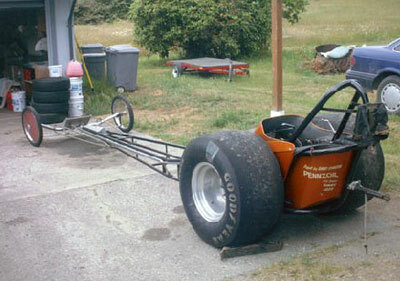 What the car looked like when it ran as a A/GD with a late model. Jerry and Tom Brazil had bought it from Webster at a race in Redding in 1971 after Webster threw a rod out of his engine. That rod failure broke Webster and he went back to college. The Brazil's then ran the car until 1981 when they finally parked and sold it. 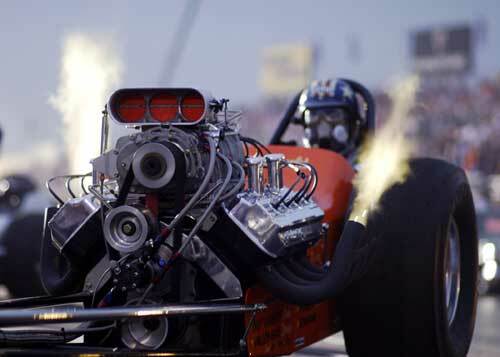 Arias Pistons - Brooks Rods - Heads by Valley Head Service - Littlefield Blower - Velasco Crankshaft - Chet Herbert Cam - K&N Filters - Kendall Oil - LaPole Headers - Cirello Magneto - Donovan Gear Drive - Three disk Hays clutch by McLeod (Master Car) - Enderle Injection & Fuel Pump. In Bill Norman's driveway in 2004. 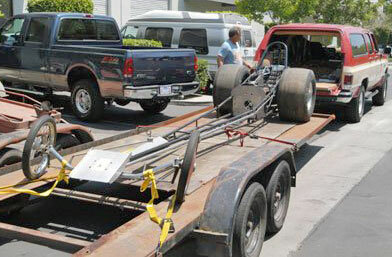 Norman delivered the car to Ewald in July of 2004. 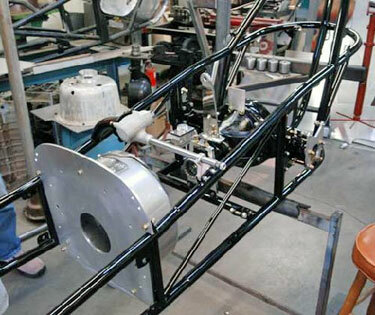 The car was first taken to American Roadster for evaluation. Although it was all there, and all original, years of neglect had taken its toll. 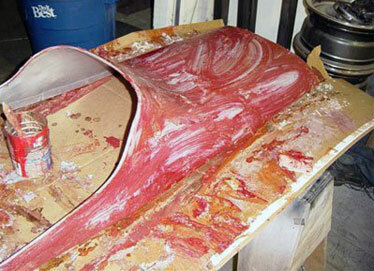 Car in a bay at American Roadster prior to a complete disassembly. 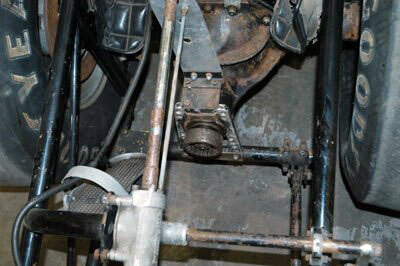 The patented Davis front suspension is obvious here. 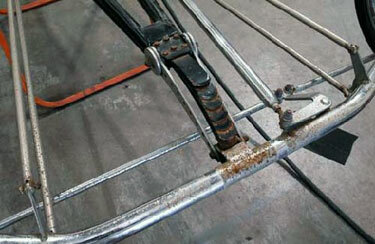 Rust, rust and more rust. 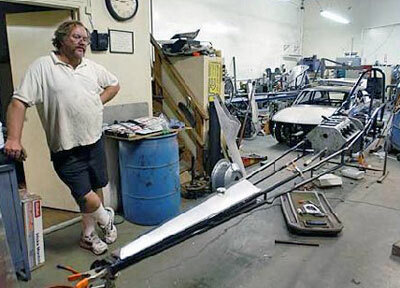 American Roadster's Alex Mikkelsen looks over the project ahead. 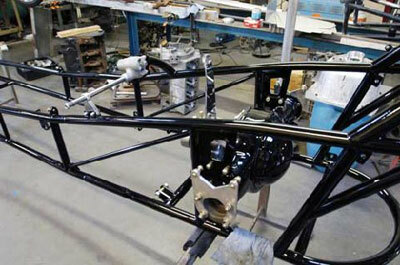 Once apart at American Roadster the engine placement is set for the new engine mounts and motor plate for the early hemi. 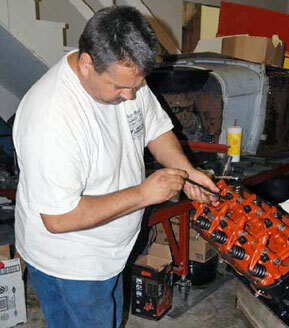 Running a 426 at the end there hadn't been a 392 hemi between its frame rails in 35 years. For those of you who don't recognize it, this is the 392 block from the ill-fated first fire-up of the BankAmericar in 2003. 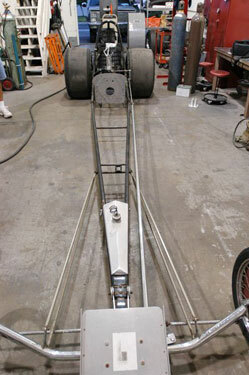 Bruce Dyda checks out his enlarged version of the Jim Davis fuel tank. 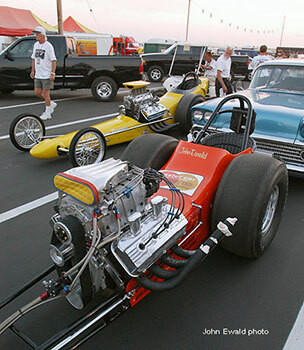 Experience has taught the owners of Cacklecars that the original 3-4 gallon fuel tanks are too small to let the engines run for over four minutes. 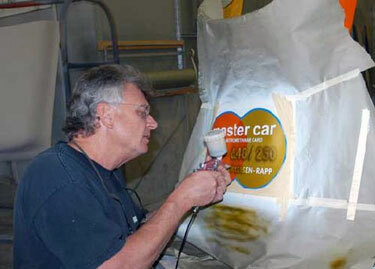 As is the case with most restorations, the car had been through more than one paint job. 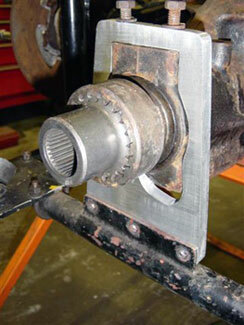 To do the restoration(s) right, the "tin" needs to be stripped bare. 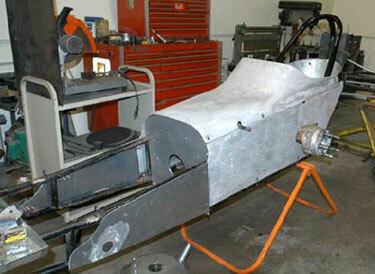 The Haggerman body after being stripped and repaired by American Roadster..
After everything on the chassis had been repaired and lined up it was off to sandblasting. 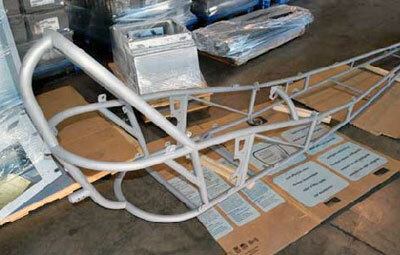 Once back from sandblast and powdercoat, the chassis goes back to Dyda's for assembly. 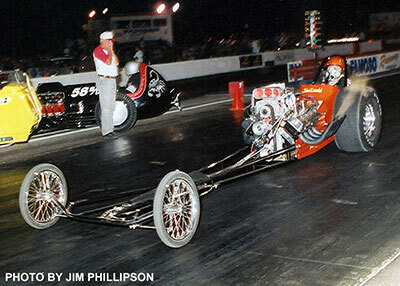 It should be noted that this was now September of 2004 and Ewald had a target date for the cars debut at the California Hot Rod Reunion in early October. 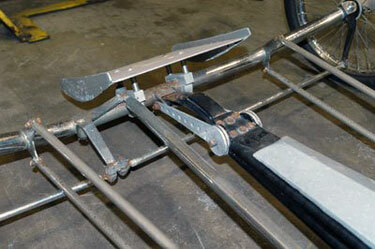 Dyda Engineering had repaired or re-manufactured all the controls and mounts. 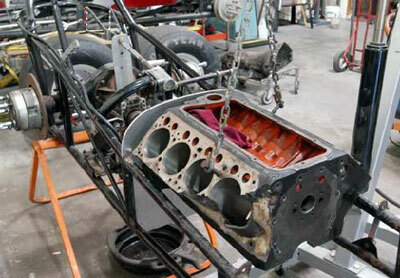 While the car was being tweaked, the engine was being assembled at American Roadster. 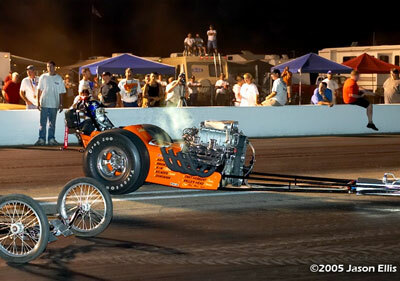 Talk about heavy hitters, here Donny Johansen degrees in the trick Herbert cam with the help of Ronnie Rapp. 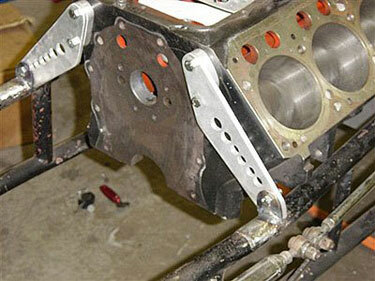 Alex Mikkelsen then installed the heads and checked push rod lengths. The body then went to Jerry Seivers at Paint-N-Place, here Jerry lays on one of the color layers. 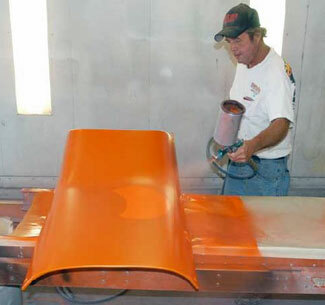 Paint-N-Place is famous for painting many new and restored race cars and hot rods. Legendary artist, Kenny Youngblood, whom also did the graphics on Ewald's BankAmericar did his magic on the Master Car as well. 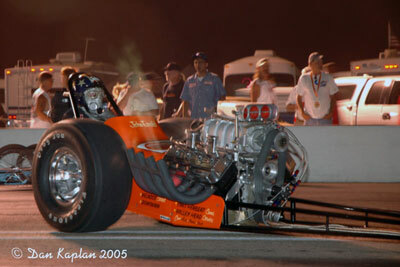 Against the odds of getting it done in time, Ewald's "Mastercar" made its debut at the 2004 CHRR. John Ewald in the pre Cacklefest Parade. Over the last 5 years Cacklefest has spawned many "spin-off" events and no one has taken them to more levels than two car owner, John Ewald. 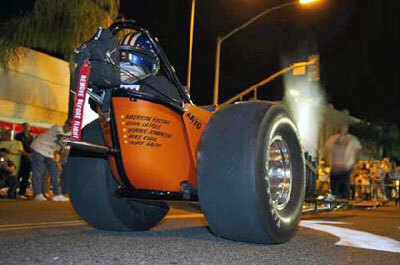 With the help of Bridgestone/Firestone Auto Service Centers, Ewald has appeared at countless events throughout 2004-2005 and plans to expand the exposure in 2006. 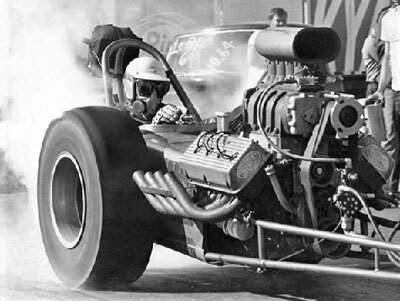 His enthusiasm and commitment to the cacklecar phenomenon has introduced myriad new fans to drag racing and its genesis. 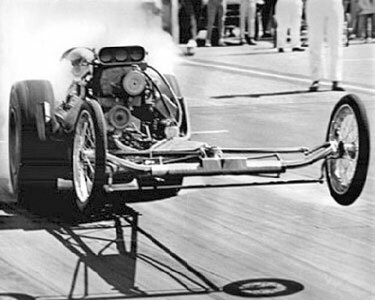 Its not that Ewald's cars are pivotal to the history of drag racing but the fact is he promotes them more and better than anyone else. 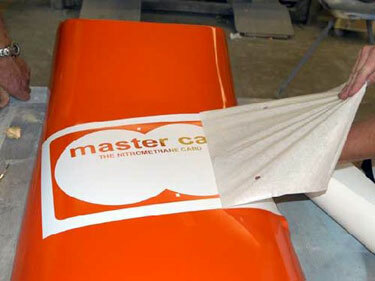 Mastercar was a huge hit at the 2005 Hot August Nights in Reno, NV. 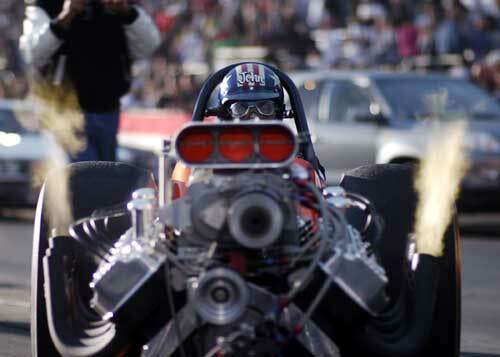 At the 2005 NHRA Worldfinals at Pomona John Ewald wowed the 30,000+ fans with daylight header flames! The Mastercar was featured on the cover of the November 2005 Bridgestone/Firestone corporate magazine with "Donna Reed Show" star Paul Peterson in the seat. 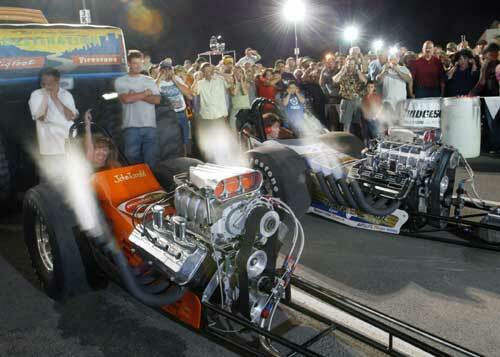 Notable appearances the dragsters were shown and or run at. 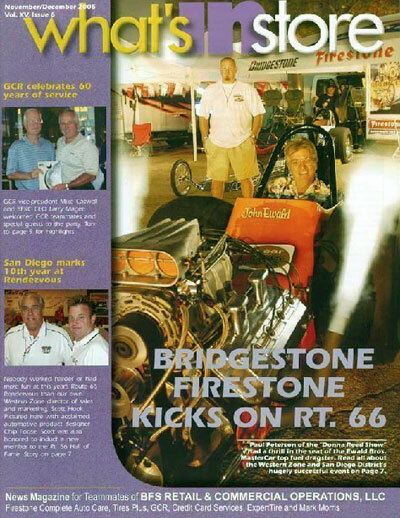 Print - Hot Rod Magazine, National Dragster, Drive magazine, Full Throttle News, Bridgestone-Firestone Corporation magazine & various newspapers in cities performed in.